Almost Unschoolers: Paper Plate Pumpking Craft For a Pilgrim Thanksgiving. Paper Plate Pumpking Craft For a Pilgrim Thanksgiving. Do you know, there were no pumpkin pies at the first American Thanksgiving? You do, if you read this blog regularly, because I've mentioned it before. But, it is news to the kids in Miss Frizzle's class. In fact, they have a hard time believing it. 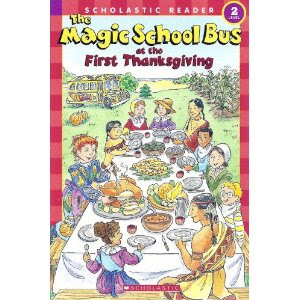 So, in typical Magic School Bus fashion, they take a field trip, back in time, to find out. As, usual Joanna Cole does not disappoint. I love that she focuses in on the lack of pie - a deprivation younger children can relate too. Naturally, such a story calls for a tried, and true Thanksgiving craft. ...and orange in the middle, for the pie. Which, just by way of a tip, would really have been better to have done first, so they wouldn't have been reaching across the wet, brown paint. While the paint was still wet, they added, and painted in, a few sprinkles of cinnamon, so their pies would small good. Then, they were ready to add the whipped cream. I think it's customary to use cotton balls as the whipped cream for this craft. But, of course, we used up all our cotton balls on our sticky spider web game, and keep forgetting to get more. Isn't that always the way with pumpkin pie, though? You check the ingredients, bake the pie, and only as you're ready to serve, remember you have forgotten to buy whipped cream. The resourceful hostess, can usually come up with some sort of substitute, like Whipped Carnation Evaporated Milk Topping. The girls settled for scrunched up pieces of plastic grocery bags. Which, got us thinking. As resourceful as the Pilgrims were, even if they didn't have pumpkin pie, they probably came up with something, equally delicious. For more fun with history, or geography, check out this week's Geography and History link-up, at Children Grow, Children Explore, Children Learn. Or, for more story stretching, arts and crafts, click over to the stART (story + ART) link-up, hosted at A Mommy's Adventures. What a great idea. Love your whip cream substitution. I am with you I have to guess that the pilgrims had something yummy to substitute for pumpkin pie. Your family is so creative! Love your craft,the grocery bag really looks good on the pie. Thank you for sharing. We always skip a pumpkin pie for Thanksgiving since nobody in our family cares for it. I'd rather have it as a craft, and it looks delicious. Great trip to the past with MSB too! Oh, they didn't have turkeys back then either, right? What DID they have? Joyful Learner - They might have had turkeys - they ate them at other times. But, they definitely had venison, and seafood, like clams, and eels - yuck! I'd totally forgotten there was no pie. That is a great pie craft. I love your substitution! I love those pies! Unfortunately, our library doesn't have that Magic School Bus book. I love your fat free version of a pie. Looks like you had fun! And the pie looks YUMMY!